In today's society, Educators face any number of issues with students within the classroom environment. 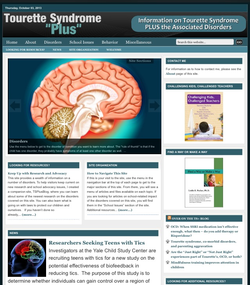 Students with Tourette Syndrome (TS) often have added or associated conditions such as ADD, ADHD, or Obsessive Compulsive Disorder. When we refer to a student who has TS plus associated conditions, we often us the term TS+. Educators have an important, if not critical, role in the lives of students with TS. As a crucial member of the education team, the teacher's approach can help the student with TS develop self-awareness and self-management. A meaningful and consistent teacher/student relationship enables the student, as he or she matures, to move from parent-advocacy to self-advocacy. Real and empathetic understanding of these students makes a tremendous difference that will carry over to affect the quality of life for them and their entire families. 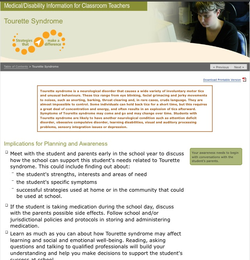 Tourette Canada has been instrumental in working with educators, families and students with TS and TS+ as the team approach is a required component in allowing a student afflicted with this disorder to develop his or her full potential. We are often contacted by elementary-, secondary- and college-level students who need printable materials for educational presentations and display boards about TS. The eye-catching PDFs below are free for anyone to print and use for educational purposes. If you don’t see a particular piece that you really need here, we will accommodate special requests for the creation of additional posters (a donation would be much appreciated). Please contact the national office at 1-800-361-3120 or tsfc@tourette.ca. a copy of Understanding Tourette Syndrome: A Handbook for Educators, 2nd Edition. We highly recommend that you consult the Tourette Canada publication Understanding Tourette Syndrome: A Handbook For Families (pictured left), which provides comprehensive information from diagnosis through to young adulthood. “TS+” is not a diagnosis. 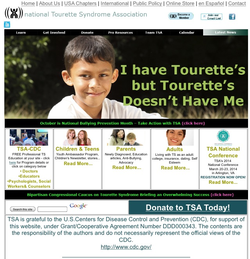 It is just a short-hand way of communicating that a child, teen, or adult has more than “just TS.” Over the years, this site expanded to include coverage of the other disorders commonly observed in conjunction with TS. Learning what disorders emerge at what ages and what to “be on the lookout for” can help parents, teachers, and clinicians recognize when symptoms of another disorder may be emerging. 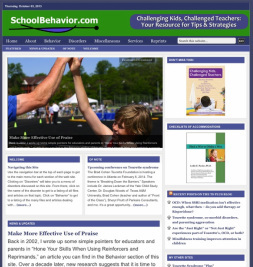 Knowing that most educators welcome practical knowledge and tools that they can use, I created this site to help educators learn about a number of neurological disorders that may impair a student’s functioning and that can occasionally create chaos in your classroom. On this site, you will find overviews of a number of disorders such as Tourette’s Syndrome, Obsessive-Compulsive Disorder, Attention Deficit Hyperactivity Disorder, Depression, Bipolar Disorder, Executive Dysfunction, Sensory Defensiveness, “Rage Attacks” or “Storms,” Anxiety Disorders, and sleep disorders. You’ll also find some tips for classroom accommodations or strategies for these conditions. and others understand, address and manage symptoms of Tourette Syndrome in the school and other settings. By offering essential TS information, we want to promote optimal teaching and learning, end stigma and promote acceptance regarding TS in school settings.